Mind the gap when you do this! It is tempting to think of sanders as finishing machines and indeed many portable sanding machines are just that. However, a bench-mounted disc sander or belt and disc sander is a much more versatile machine with a wide range of uses in preparing and shaping work and in joint making. 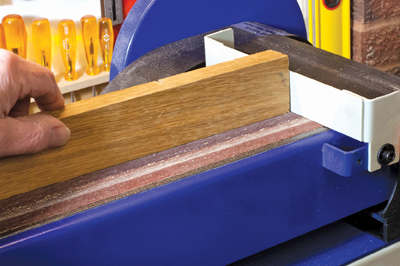 Sanding a piece square to a pre-marked line can be much quicker than shooting it square with a plane and shooting board, especially if the machine is permanently set up on your bench. 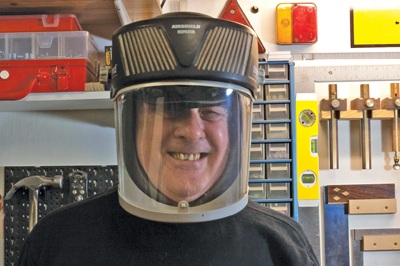 It is also tempting to consider sanding machines to be inherently safer than other workshop machines; they are after all just a powered piece of abrasive with no sharp cutting edges, aren't they? 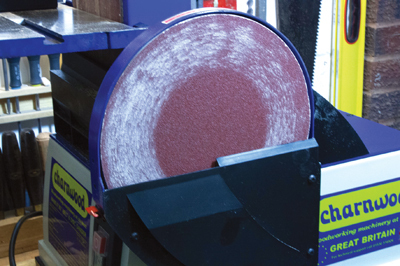 Not so - a revolving abrasive belt or disc can remove skin and bone just as effectively as it can remove wood and metal. All sanders also produce large quantities of dust, so extraction is essential. All workshop machinery should be treated with respect and disc sanders are no exception to this rule. 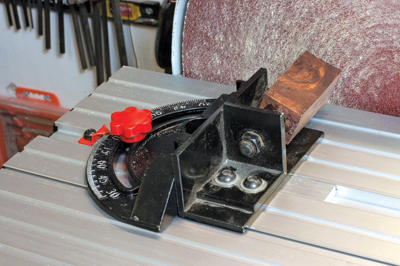 Woodworkers who own a lathe can easily make their own basic disc sander by fixing a suitable disc to the spindle and mounting a shopmade table to the tool rest support. 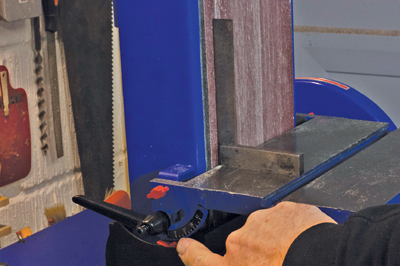 It is even possible to mount a disc on a spare electric motor or electric drill in a horizontal stand as a makeshift measure, but serious woodworkers will want to have a dedicated machine with proper guarding and extraction. Disc sanders are essentially simple devices consisting of an electric motor driving a disc to which abrasive discs may be fitted either using adhesive backing or hook-and-loop fixings. 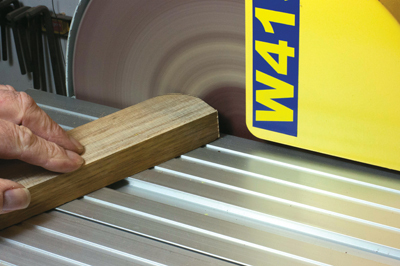 They normally run at a fixed speed and are fitted with a table and mortice gauge to support and guide the work. 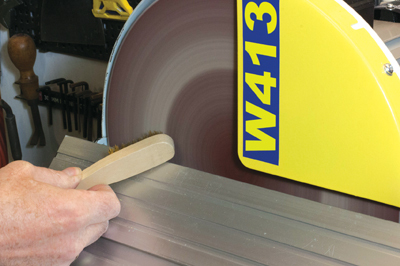 Some more expensive machines have variable speed which allows for the sanding of a wider variety of materials. 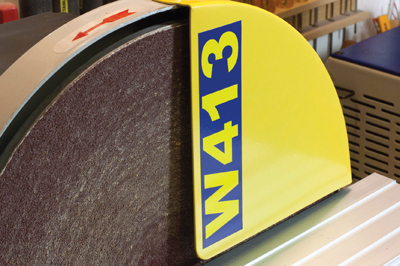 Belt and disc sanders are also fitted with a continuous belt of abrasive running on rollers. This may be oriented either horizontally or vertically to suit the work in hand and may also be used with the table and mortise gauge. Used with a suitable abrasive belt and jigs this latter type of machine may also be used to grind and sharpen woodworking edge tools. You should select a machine with a motor appropriate to the intended use. 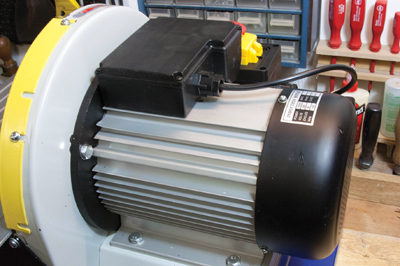 DIY machines tend to have half hour rated motors which, as the name suggests, can only be run continuously for about half an hour or so, whilst the motors in industrial quality machines will run happily all day long. A robust table which is mounted square and true and has an accurate mitre slot parallel to the disc or belt face is essential for accurate work and for safety. A quadrant guard is fitted to most disc sanders but not usually to belt and disc sanders. The guard prevents the work from coming into contact with the part of the disc that is moving upwards and thus limits the possibility of work being lifted from the table or thrown towards the operator. 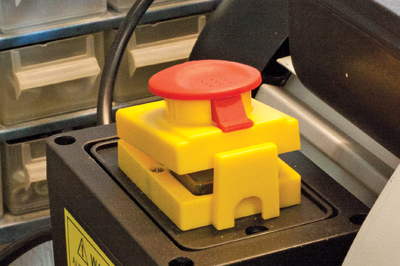 Care should always be taken when using machines that are not fitted with a quadrant guard to only use the side of the disk that is moving down towards the table. Most disc sanders are fitted with a disc of 250-300mm diameter. Combined belt and disc sanders tend to have smaller discs of around 150mm. 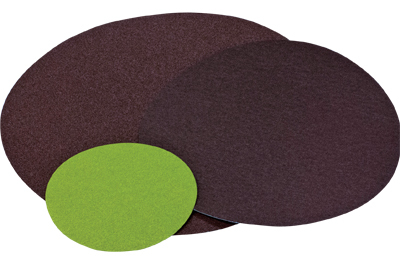 Most are intended for use with abrasive backed discs but some newer machines use hook-and-loop type backing - such as Velcro - which allows for quick changing of discs to the grit or type of abrasive required. The most commonly used disc material for woodworking is resin bonded aluminium oxide which is available in a wide range of disc sizes and grits and with either adhesive or hook-and-loop backing. Dust is one of the greatest safety hazards in woodworking. 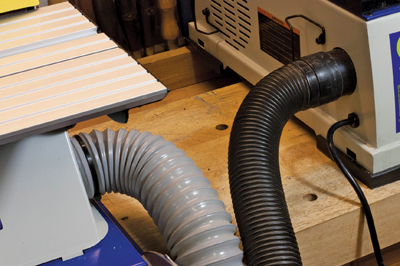 Because its effects are not immediately obvious but build up over time, it is easy to disregard, but direct extraction is essential with all forms of sanding machinery, preferably supplemented by a fine dust filter and appropriate personal protective equipment such as a mask or respirator. A heavy cast iron or steel plate body that can be bolted down to the bench or a dedicated mounting stand will prevent unwanted movement of the machine in use. NVR switching is an essential feature to prevent accidental starting and all modern machines will have this fitted as standard. 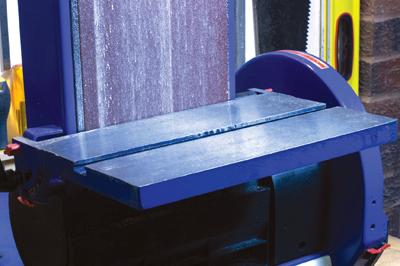 A good machine will have a strong mitre gauge against which work can be securely held if necessary. 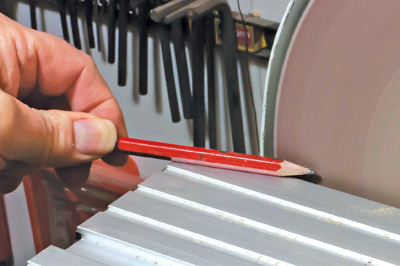 A flimsy mitre gauge is often an indication of a poor quality machine. Jigs and other fittings can be purchased or made in the workshop to facilitate particular tasks or functions. 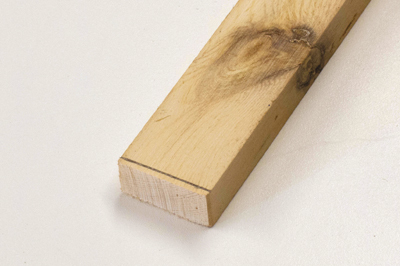 This jig, for example, enables the trimming and squaring off of wooden or acrylic pen barrels. 1. Do not wear loose clothing or jewellery, tie back long hair and wear, as a minimum, eye and respiratory protection. Keep the workshop around the machine free from obstructions so that you are free to move around without any restraint or trip hazards. 2. 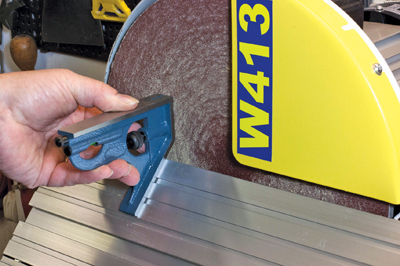 Allow the sander to get up to speed before bringing the workpiece into contact. Your sander may be fitted with a brake to bring it safely to a stop. If not, allow it to come to rest naturally, do not use anything to slow down the disc. Keep your hands clear of the revolving disk by at least 100mm. With belt sanders take care not to touch the moving belt. Use only the side of the disc that is moving downwards towards the table. 3. 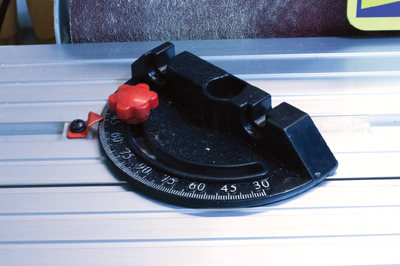 Use an engineers' square to check the accuracy of the table setting pointer. 4. Always use a dust extractor and, if possible, you should back this up with a fine dust filter. 5. Before beginning work, set the table to the desired angle and make sure that it is secure and at the correct distance - about 1.5-3mm - from the sanding disc. 6. Keep the work moving across the usable area of the disc to avoid wearing out one area of the abrasive disc prematurely. 7. Clean the disc as necessary with a cleaning block or brass wire brush to keep it cutting quickly and cleanly. 8. 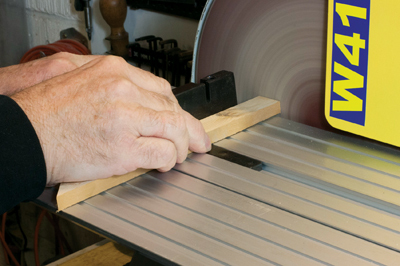 Use the mitre gauge to ensure that your square ends and angles are true and sharp. 9. Mark the area to be sanded away so that you can see where to work up to. 10. Rounded ends and corners can be worked freehand on the table without the use of the gauge. Always place the work firmly on the table then move it onto the revolving disk. Never use the disk without the table in place. Don't use excessive pressure or hold the work against the disc for too long as this is likely to cause burn marks on the work and excessive wear to the abrasive disc. 11. The belt is tensioned by means of a lever which is released to enable changing of the belt. 12. 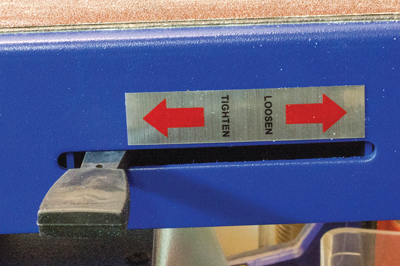 An adjuster is provided for tracking of the belt, which keeps it central on the rollers. 13. 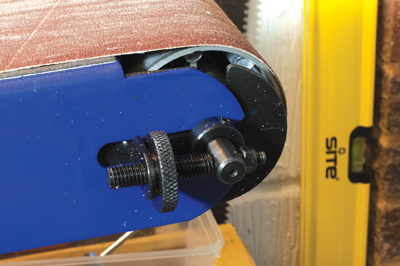 Longer edges should be worked on the belt sander to avoid having to use the upward moving side of the disc. Use the stop to hold the work. 14. 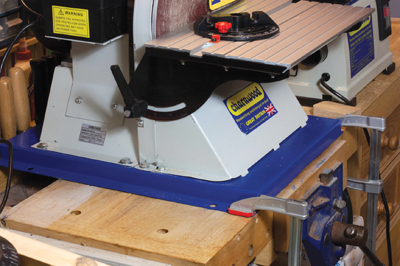 With the use of a jig or with the table set to the appropriate angle and using a suitable abrasive, the belt sander can be used as a finisher to sharpen woodworking tools. Oh! And don't forget you can use the belt or disc to sharpen your pencil too!